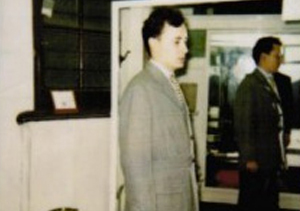 This is a picture of me in one of the fitting rooms at the original Anderson and Sheppard premises at 30 Savile Row. I was trying on The Prince of Wales, Norfolk jacket. My father asked me to try on the jacket as I had a similar slim figure to the Prince at that time. My father just wanted to make sure it came up to his measurements. I was 21 years old at the time and I was the under cutter to Mr Pitt. I went on to learn under my Father John Hitchcock.